Sally Rogers: My Aunt Agnes was right. You know what she said when she saw Randy at the bowling alley? She said, "Sally, you can't tell a book if the title's covered." 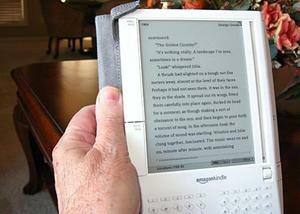 This is the Amazon Kindle. The one you see here isn't vibrating or startled; I think it's a demonstration of the fact that it has a wireless connection, so those would be radio waves. This is probably the coolest e-book I've seen. It's about the size of a paperback novel, but you don't have to deal with text getting all curvy as it dips into the center margin. The text is crisp and clear and adjustable in size. The unit, out of the box, can hold about 200 books, but there's a space for a standard SD card of up to 4 gigabytes, which is a BOATLOAD of books. You can also subscribe to several magazines and newspapers, and a few blogs as well (such as Reality Blurred or BoingBoing). The subscription price is a little cheaper than the newsstand, and you're not getting any ads. Unfortunately neither are you getting comics or classified ads from the newspapers yet, but perhaps that'll come in the future. 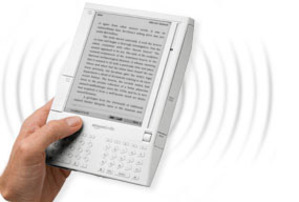 The books' format is proprietary to the Kindle, which means that for best-sellers and such you have to order from Amazon. The good news is that the Kindle edition is usually $9.99, which means that even though the Kindle itself is nearly four hundred dollars, the savings over even Amazon's price means that (in my case, anyway) it will pretty much pay for itself before long. The Kindle can also handle plain text files (such as books from Project Gutenberg), and you can use it to read Microsoft Word files and PDF files, among a few other formats. You could also, if you're so inclined, store MP3 files on it and listen to music as you read. OK, I've gushed enough, and the last time I was nearly done with this post my browser crashed and I lost the whole thing. So let me say that if you're as big a reader as I am, this is one gizmo worth checking out. I've had my Kindle for about a week and a half now and I love love love it! I still haven't done any tricky things with it yet, I'm too busy reading. Looks pretty cool. Four hundred dollars buys a lot of books though. Yellojkt--That is true, but can you carry $400 worth of books on a plane with you, or take them all on vacation? You can with a Kindle :) Then you can get some more! I'm getting a little addicted. I also especially like that you can change the size of the print--no squinting if I've forgotten my glasses. The only downside is I won't be able to pass a book I loved along to a friend to share.